Venetian blinds make a subtle statement. 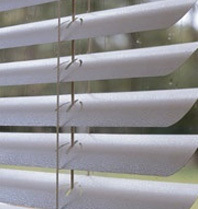 Aluminum blinds feature an anti-static finish that repels dust and resists scratches and stains. * Control Options Easily regulate the light in each room with your choice of controls. * Privacy and Light Control Ensure that your blinds provide the level of privacy you desire with route less blinds and cloth tapes. For a touch of elegance and warmth, look no further than Venetian blinds. Their slatted design makes them fashionable for offices as well as the home and you can combine them with curtains for added warmth and darkness. You get great control over the filtration of light into any room as they are easy to adjust and they are also easy to wipe down and clean whilst fitted into your window. As suppliers of made-to-measure Venetian blinds, you have the option of taking a look at our Venetian blinds in one of our showrooms, or having a free home visit, giving you the chance to view every style of blind available in the way that’s most convenient to you. you may get in touch to arrange a free home visit from one of our friendly professionals.